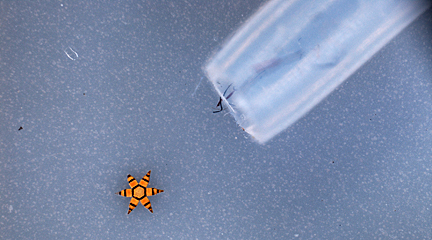 Tiny Mu-Gripper 'robots' the size of a speck of dust are the latest way to perform a biopsy in the constrained regions of the body. In the April print edition of Gastroenterology, the researchers described their use of the mu-grippers to collect cells from the colon and esophagus of a pig, which was selected because its intestinal tract is similar to that of humans. “This is the first time that anyone has used a sub-millimeter-sized device—the size of a dust particle—to conduct a biopsy in a live animal,” said David Gracias, an associate professor of chemical and biomolecular engineering whose lab team developed the microgrippers. Technovelgy readers will not be surprised if I reference the Proteus from the 1966 film Fantastic Voyage. However, a more intriguing reference comes to mind; the cookie-cutters from Neal Stephenson's 1995 novel The Diamond Age.